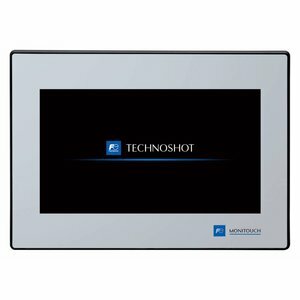 The Techno Shot series Hakko Electronics consists of two WVGA models in 7 and 10.2 inch screen size with a resolution of 800 x 480 With the three universal communication ports, you can connect to all standard PLCs, inverters and controllers via RS232 / 422/485 and MPI . There are also two USB ports and a 10/100 MB Ethernet port provided for quickly configuring the touch screens and the links to other devices such as scanners and printers or external storage, for example, programs, recipes, data and images. On a USB stick, you can save programs, recipes, data and images and photographs. Like the other models in the range, you can create Monitouch 1024 pages with each page multiple layers with 1024 pages you can calls. 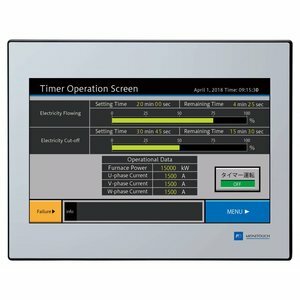 Popup window On each of these pop up screens you are not limited in the number, size or type of actuator that you want them to display or use. The extensive library of tree and "drag and drop" functionality, you will find thousands of "parts" to use in your application. You can of course also add parts or import and save them in your own library. - Tellus and V Server software for easy operation and maintenance via remote PC, or linking databases from a remote PC.